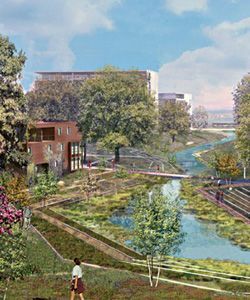 Urban Flow: Vinci Consultants helps cities maximize their natural benefits. Human settlements are naturally concentrated around water bodies, but as cities develop, they can negatively impact the water environment upon which their very prosperity depends. Urban activities not only cause pollution of local water bodies, they also affect the absolute availability of water through a combination of microclimatic and population-driven factors. In an environment where government support for water efficiency projects is lacking, it is critical that private companies and service providers take a role in the promotion of environmentally responsible practices. Vinci Consultants, a small company that is wholly dedicated to improving the way that water is managed in Quebec, Canada, and throughout the world, believes that cities and extra-urban developments can’t be viewed in isolation from the natural resources that surround them. Vinci’s Sara Finley says in addition to the company’s team of engineers, it employs a water treatment specialist, a city planner, and a chemist. “We step outside of traditional engineering by involving many points of view,” she says. One of the team’s hallmark projects is the Circus Arts Complex of Cirque du Soleil. Built on old quarry turned into a dump, it was recovered and turned into the complex. Vinci played the role of civil engineer, turning the complex into a near-zero discharge site. The team directed all roof rainwater into an infiltration basin that is almost undetectable and could handle a 100-year stormwater event.